“Packages Comparison. Room prices that include food or beverage items such as breakfast or dinner, entertainment items such as tickets to a show, and/or free local calls, parking or other bundled items will be considered as packages. These package or inclusive rates must be compared to prices with the same type of inclusive items. So as well as paying £30 more for my room, I was told that my booking didn’t include breakfast! And because my booking was non-refundable, I couldn’t cancel my booking. 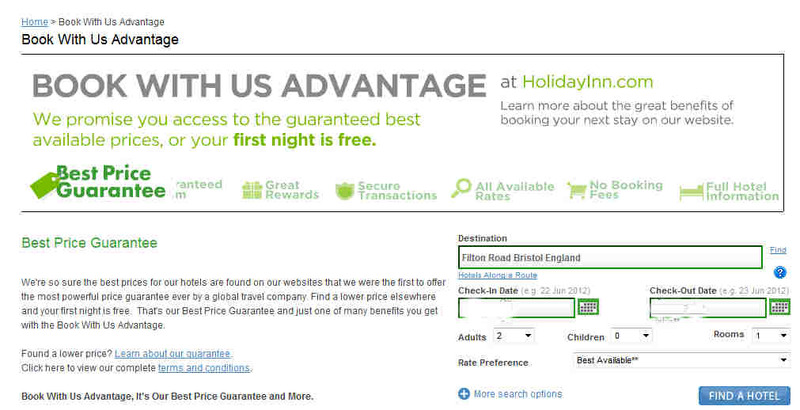 The moral of the story is, don’t book with Holiday Inn Best Price Guarantee! And whilst we all know to ‘read the small print’ – you also need to be able to second guess the myriad ways in which the terms in the small print could be defined by the company offering the ‘deal’.